Expert advice on shifting from brick and mortar to bytes and bits. 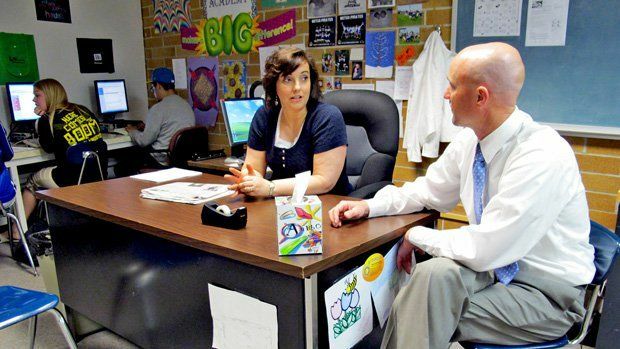 As the Idaho Digital Learning Academy's liaison for southwestern Idaho, Jeff Farden occasionally makes face-to-face visits with the staff he mostly supervises online, like Notus Junior/Senior High School site coordinator Tricia Shelden. But shelve the guilt -- online teaching also serves much higher causes. The online teachers and administrators we've interviewed say it gives you the flexibility to tailor your pacing to the needs of individual students and to get to know your students better through a lot of one-on-one conversations. Teachers also get to use modern-day technology tools in everyday practice, not just as occasional add-ons, and they get to master a form of teaching that's likely to reach millions of new students each year in the United States and abroad. If you're interested in taking your teaching skills online, there are several ways to go. Some make virtual teaching their full-time occupation. Some do it part-time, moonlighting for extra cash and experience. And more and more, traditional teachers are becoming switch-hitters who bring the best online strategies to their face-to-face classrooms. No matter which path appeals to you, below you'll find some tips on how to get started as an online educator and what challenges to expect. The advice comes courtesy of Kerry Rice, assistant professor and associate chair of the Department of Educational Technology at Idaho's Boise State University, and Mike Caldwell, director of supervision and development at the Idaho Digital Learning Academy (IDLA). When you do this, however, make sure you're getting a quality experience. All online courses are not created equal. That means the course you take should be fully facilitated by a very involved instructor, says Rice, and it should be interactive, leveraging tools like discussion boards, live conferences, and wikis to create a collaborative, inquiry-based learning environment. What you don't want is simply a self-paced tutorial. Then follow up with some research. You can use Edutopia's free resources and tools to find guidelines and examples of best practices. If you want to teach classes that are completely online, here's your next step. Once armed with information from your research, Caldwell suggests you find the virtual schools in your state that are using model strategies and then look for job opportunities there. That sleuthing turns out to be extra important when you get your formal training, because that training is likely to come from the school that hires you. As Rice explains, most colleges and universities don't offer degrees or certificates in online education (BSU is a precocious exception), so preparation tends to happen on the ground. Be prepared for challenges. Rice's research with new online teachers shows that more than anything, they need help with isolation. Even in your slippers, home can be a lonely place if you work there every day. Rice suggests that you join a professional community online. Possibilities include Classroom 2.0, or, if we may humbly suggest, Edutopia's online-learning community group. And keep in touch with colleagues from your school via instant messaging, email groups, and, if possible, face-to-face meetings. Second to isolation are problems with technological know-how. Your formal training should give you the basics, but be sure to reach out to colleagues or your online community for further help. That's especially true as you get into more complex questions of strategy, such as the following: How do I build community in my classroom? How do I foster active participation and engagement? How do I assess online? Finally, consider your game plan for time management. Your time will be vastly more flexible and your tasks will be portable, but that can backfire if you let yourself get sucked into work 24-7. Plus, you'll have many more one-to-one communications with students than you do in your face-to-face classroom. Rice suggests that you set a regular schedule for yourself and check email only once every four hours or so. Whatever your learning curve, take confidence from your teaching experience. Yes, online instruction requires some new skills, but it's not entirely different. "You still have to be patient, you'll still be working with kids, and you still need to find multiple ways of presenting the content," says Caldwell. "Some of those qualities that you have are still going to be just as important online." If you plan to stay firmly planted in a face-to-face classroom, but you'd like to tap into the benefits of online education, you can create what's called a blended environment. That means your students encounter a healthy dose of virtual content and interactivity (such as discussion boards and multimedia productions) right there in the real-world classroom. Look to professional communities online (see above) for advice on how to continually improve your techniques. With luck and some good lessons learned, your experiment could grow into your regular MO. And it just might catch on with your fellow educators. Even if you go it alone, though, it'll make you a more modern, versatile (and marketable) teacher. Although many states and schools offer their own training programs once a teacher has been hired, here are some additional resources to get training to become an online teacher.